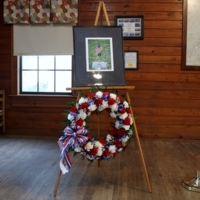 A red, white and blue memorial wreath placed on a stand displaying a photograph of a headstone and an American flag. Cravero, Geoffrey. 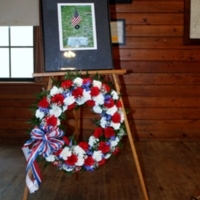 “Memorial Wreath.” RICHES of Central Florida accessed April 25, 2019, https://richesmi.cah.ucf.edu/omeka/items/show/10418.